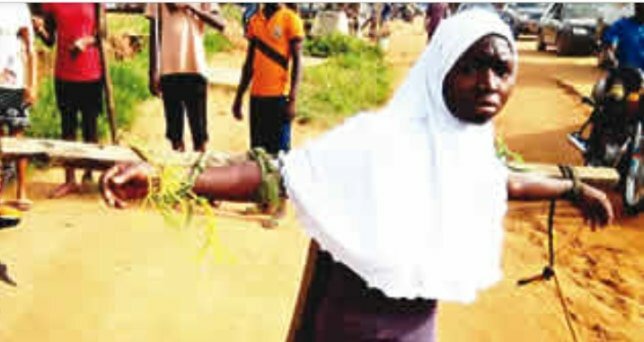 Students Reportedly Tied to Crosses and Flogged for Being Late to School. 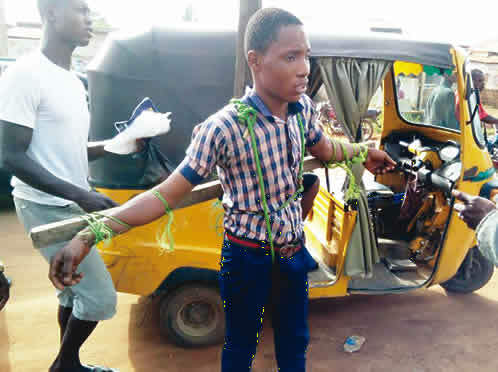 Two people have been arrested in Ogun State after two students were tied to crosses and flogged with horsewhips — an alleged punishment for being late. The two – including the proprietor and a principal – were taken into custody after a police officer stumbled across the incident. SEE ALSO: Students Attack Teachers, Vandalise Property For Not Allowing Them Cheat in WASSCE. The proprietor, Afolayan Joseph, and the yet-to-be-identified principal were said to have tied the pupils for allegedly coming late to school. The policeman, who is attached to the Inspector-General of Police Monitoring Unit, told Punch that the pupils were tied to the wooden crosses in the open. He said, “I was going to work this morning (Wednesday) when I saw some cars parked by the roadside. I discovered that it was because of some pupils that were tied to crosses. When I saw it, I parked and went to meet the proprietor of the school. I introduced myself as a policeman and told him to untie the pupils. He refused, saying there was nothing anybody could tell him that would make him to release them.